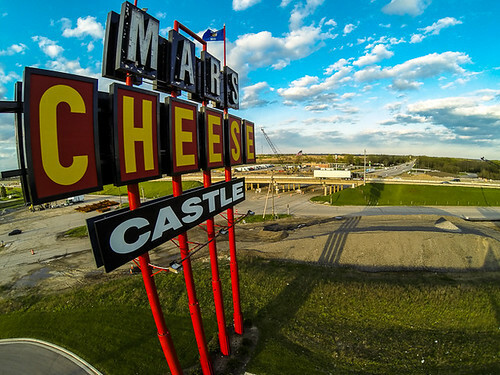 The Mars Cheese Castle is filled with Wisconsin goodness, including lots of Wisconsin cheese. The giant cheese sign can be seen off I-94 just north of Kenosha. In the past couple of years, Mars built an entirely new facility, or Castle, and moved the giant sign just a bit farther west. Anyone who travels out of Wisconsin on I-94 has seen the sign, and I wanted to capture it from an aerial perspective. This was the first time since I've been flying kites that I had the wind change directions 180 degrees in a matter of 5 minutes. I had the kite flying to towards the southeast when I started, and it shifted towards the Northwest within a few minutes of having the kite up. Really strange, but this direction works well for capturing the sign. There is a lot of construction around the site, as they bulldozed the old cheese castle. Wind was light be steady, so I only flew with one camera, a GoPro HD Hero 3 on a static rig. 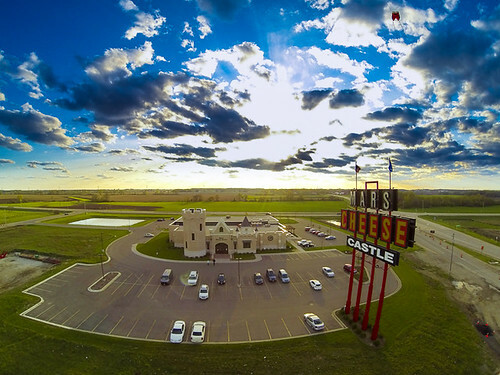 The cheese castle is a tourist trap for Illinois residents heading out of state. Though the selection of cheese and root beer is excellent, locals know that you can go down to Woodman's a few miles away and pay half for your cheese curd fix. 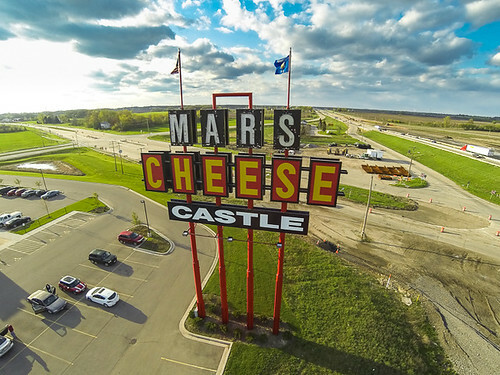 To view more pictures from the Mars Cheese Castle Aerial session, click here.